BARCELONA MIDFIELDER JAVIER Mascherano believes Lionel Messi has yet to reach his peak and thinks his compatriot will only get better. The prolific attacker is widely regarded as one of the best players in the history of the game, winning the Ballon d’Or four times between 2009 and 2012. Yet Mascherano has stressed that the world has yet to see the best of the 27-year-old after a relatively disappointing 2013-14 campaign. “Messi has so much to give. I don’t think we have already seen the best version of him,” Mascherano was quoted as saying by El Mundo Deportivo, before praising the attacker’s role in Argentina’s successful World Cup campaign. “From the round of 16 on, Messi realised that we could not play in a certain way where we could focus on our attack. We had to prioritise and focus on defence, leaving him and [Gonzalo] Higuain a bit isolated. “Leo had to do his defensive work as well and that he was willing to go there shows how much of a great he is. We all knew that it was not the style he preferred, but he never complained once. Messi netted four goals in seven appearances at the World Cup, winning the Golden Ball in the process. Email “We haven't seen the best of Messi yet, says Mascherano”. 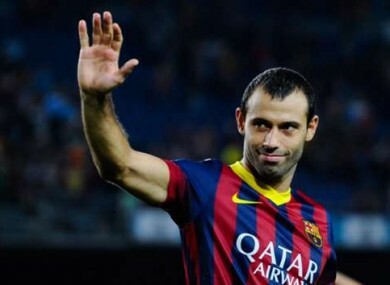 Feedback on “We haven't seen the best of Messi yet, says Mascherano”.